The first generation Prius is a special car. The word “prius” means to “to come before” and, indeed, when it debuted in the US market, its technology marked a paradigm shift. Very quickly the modest car established hybrid appeal and influence, eclipsing its Honda rival, the Insight, as well as the development of hydrogen cars. For all its good intensions, the Gen 1 Prius also has “special needs”. It was a sophomore experiment, a rare gamble by a notoriously prudent automaker to compete on fuel efficiency in the midst of the SUV craze. Not surprisingly, almost ten years later, the early Prius is fraying from the cutting edge. Hybrid Synergy Drive Transaxle—a elegant liaison between two motor-generators and an internal combustion engine, first of its kind in the automotive market. The design was patented decades before (by TRW) but it was modern computer control that allowed the “synergy” to work smoothly. 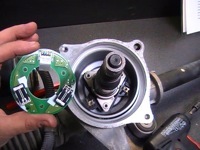 Electric Power Steering—though first seen on the 1993 Acura NSX, EPS was a strong candidate to allow steering assist at low speeds (when its most needed) when the Prius engine would be off. 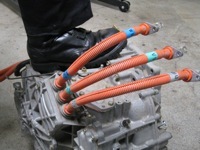 In comparison, the Toyota RAV4 EV uses an electric hydraulic pump for conventional assist. 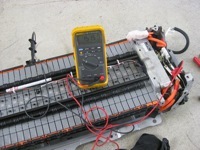 High Voltage Battery Pack—38 Panasonic NiMH modules per pack, 7.2V each, for a nominal voltage of 273.6V. The RAV4 EV and the pre-Prius (a.k.a. model NHW10, sold only in Japan starting in 1997) use different batteries. Though similar looking, the Gen 2 Prius (a.k.a. model NHW20, model years 2004-2009) employs different, updated Panasonic batteries.